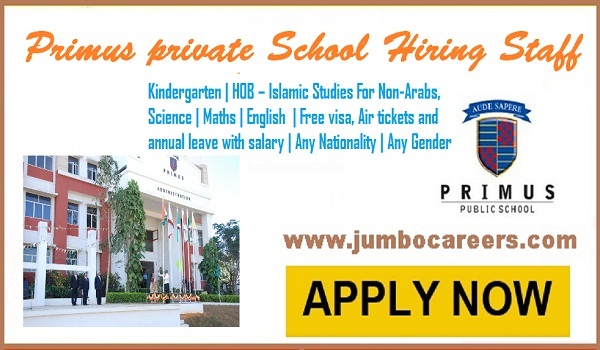 Leading CBSE school in Dubai- Primus private school urgently hiring teaching Staff. About the School : Primus Private School, situated in Al Warq’aa, was launched on 6th of April 2008. The school is educating pupils from Pre KG to Grade 11 in the CBSE, Indian Curriculum with student’s strength of more than 1600. The School has child friendly classrooms to facilitate modern teaching methodologies and has thus embraced the advantages that higher technology has to offer and ensured its smooth blending with traditional chalk and talk. This makes an emphatic statement about the school’s commitment to gearing students to navigate the information superhighway that is changing the world.